This couple hosted their wedding reception at the amazing Harbor Club @ Prime located on the waterfront of Huntington Harbor. This incredible upscale venue was recently acquired by, and completely renovated by the renowned Bohlsen Restaurant Group of Long Island, NY. The food is spectacular. The service is impeccable. The decorating is contemporary and chic. But, above all, the sunsets here can be awesome. This is just one evening’s display by Mother Nature. If you look further on this web site you will find other fantastic sunset pictures. I have been working at The Harbor Club at Prime for many years. 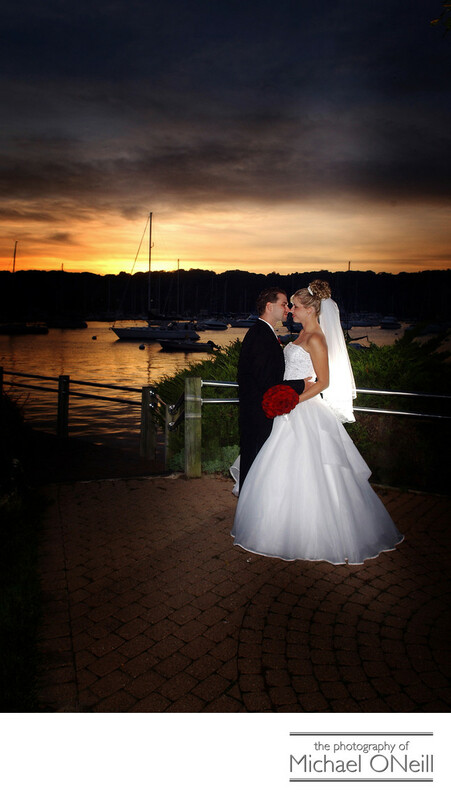 It is located just ten minutes from my East Northport, New York wedding photography studio so I have garnered a lot of experience creating great wedding photos at this establishment. Give me a call if you’re planning a Harbor Club at Prime wedding. I’d love to create your sunset masterpiece for you!